DRS Water System allows to find water up to 200meters deep. 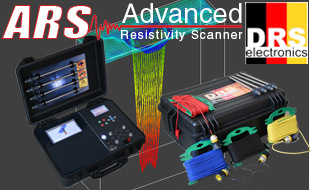 It’s based on our Advanced Resistivity Scanner (ARS). This is achieved through resistivity analysis. Resistivity is an intrinsic property that quantifies how strongly a given material opposes the flow of electric current. This technique is used on construction and archeology. The ARS will send electrical current in the soil thanks to 2 or 4 probes for theorically depth up to 100 meters ! Then it will analyse the results of the bounced signal layer by layer. It will determine what is the most important component below your feet and in this case Water. It can only find water. 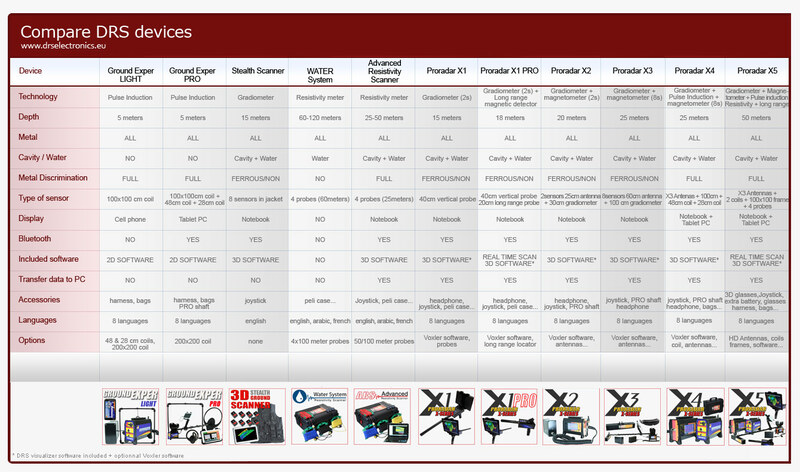 if you look for cavities and metals you should consider learning more about ARS. Insert at least 2 probes half way in the ground. Place the device in the middle of the probes. The farther the probes are one from another, the deeper the scan goes. That is why the lenght of the cable matters. If you place 2 probes 6 meter far from the control box (12meters of cable), then you achieve a scanning depth up to 6 meter. You can also use 4 probes to cover more ground. 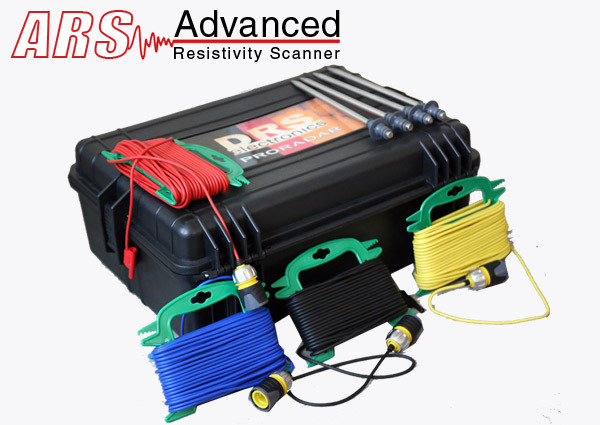 Standard Equipment includes 4 cables/probes of 25m each meaning you can reach depth up to 50 meters with 2 probes and 25 meters if you use 4 probes. You can purchase optional and 4x100meter cable for depth up to 200 meters ! Remember that ARS makes analysis of the soil layers by layers, meaning that if you can identifiy what’s below your feet at a predifined depth. If you choose to scan what’s at 5 meter depth, you will not see what’s below or above 5 meters. To see what’s at 6m depth, you have to scan the 6m layer by adjusting length of the cables. ARS send current then electronically checks ground resistivity between 2-4 probes. ARS will scan lines between each probe and tell the result on the screen layers by layers of the soil directly on the machine with LED.